“Fascinating a certain order of Protestants” is precisely what this Year of Faith is intended to do. At a Synod of Bishops in Rome in October, 2012, Pope Benedict XVI inaugurated the “Year of Faith” that he had announced in his Apostolic Letter called “Motu Proprio Data.” The Year of Faith commencement date of October 11, 2012, was chosen because it is both the 50th anniversary of the Second Vatican Council and the 20th anniversary of the publication of the 1992 Catechism of the Catholic Church. The teachings of Vatican Council II on ecumenism are indeed “a sure compass” by which to read the Papacy’s current actions - for the “new” outreach of the Catholic Church, as outlined there, is nothing short of a grand design to ensnare the true church of our Lord Jesus Christ. At its centre, the goal is to lure unsuspecting believers away from biblical Christianity, to remove any and all “obstacles to perfect ecclesiastical communion,” and bring them all under the yoke of Roman Catholicism. To analyze the inaugurated Year of Faith, there is no better statement than that offered by C. H. Spurgeon when he wrote, “Essence of lies, and quintessence of blasphemy, as the religion of Rome is, and it nevertheless fascinates a certain order of Protestants...”As we shall see, “fascinating a certain order of Protestants” is precisely what this Year of Faith is intended to do. 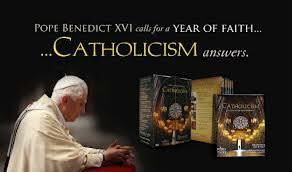 One of Papal Rome’s intentions in the Year of Faith is to commemorate the Second Vatican Council. The reason for this is that the Second Vatican Council’s ecumenical overtures have been so successful. Formally, the Council moved from a position of separation from other religions to a new two-pronged strategy of acceptance to win the world back to Rome. First the pagan religions of the world such as Islam, Buddhism, and Hinduism were formally designated as acceptable to the Papacy. Second, the Council addressed Evangelicals in particular. “Separated brethren” was the new term the Council coined for those who before were always considered heretics. In the Council’s Document No. 42,the methods of ecumenism were carefully prescribed, the most important of which was to use“dialogue” to make incremental advances into Evangelical and Bible-believing churches. One thing made clear at the October 2012 Synod of Bishops is that this program of ecumenical dialogue, now fifty years in the works, has proved to be tremendously successful. One can see this by a change in the use of language by the Catholic Church in the documents that are intended for consumption by non-Catholics, particularly Evangelicals. Although much more Scripture is used and serious attempts are made to imitate Evangelical patterns of thought and speech, the intent is simply to provide cover for the traditional,unbiblical, and uncompromised Roman Catholic doctrine. Behind the curtain of this new showpiece from Rome is merely a reiteration of the same old dogmas that have been ruthlessly imposed upon Catholic people for centuries. Fifty years of “ecumenical dialogue” makes visible a tremendous Catholic infrastructure devoted to the success of their Trojan horse, which some leading Evangelicals in particular have been so willing to haul into their churches. 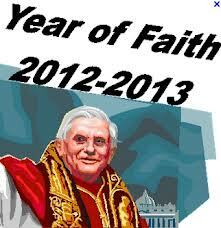 ‘Year of Faith’ is nothing else than an effort to continue the marketing and repackaging of Roman dogmas. 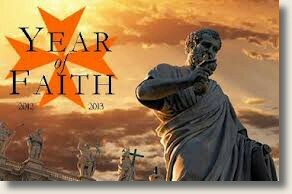 It is clear then, that the Year of Faith is nothing else than an effort to continue the marketing and repackaging of Roman dogmas that was started at the Second Vatican Council. Further, October 13th in the Year of Faith “will focus on the presence of Mary in the Church,” and June 2nd will be set aside for a day of global Eucharistic Adoration, the idolatrous practice of worshipping the communion bread of the Roman Mass. Thus, Papal Rome decrees that, “On 2 June, [the feast of] Corpus Christi, the Blessed Sacrament will be adored at the same time all over the world.” Clearly the dogmas of The Council of Trent (1545-1563) together with the superstitious medieval Mariolatry and the idolatrous practice of Eucharistic adoration yet persist in Papal Rome today, and the Year of Faith is simply intended to make it more palatable to Bible Christians. The Christian faith is not simply teachings, wise sayings, a code of morality or a tradition. The Christian faith is a true encounter and relationship with Jesus Christ. Transmitting the faith means to create in every place and time the conditions which lead to this encounter between the person and Jesus Christ. The goal of all evangelisation is to create the possibility for this encounter, which is, at one and the same time, intimate, personal, public and communal. 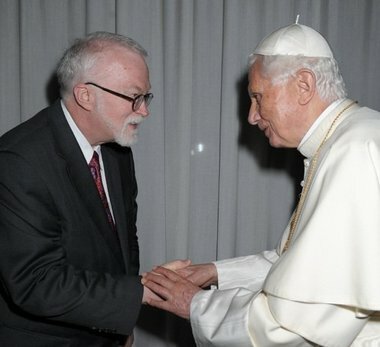 ...ecumenical agreement on the Eucharist is being found by acknowledging that the Eucharist is not just my personal encounter with Christ in a re-enactment of the Last Supper, it is also a celebration of the Church, empowered by the Holy Spirit, in a foretaste of the future heavenly banquet. Now, these complementary emphases are very prominent in the Catechism of the Catholic Church, and we can therefore immediately note the ecumenical value of this new resource. 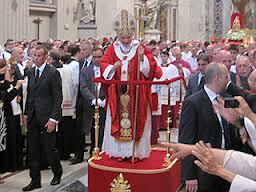 Thus, the Roman Church attempts to rob God, namely, the Holy Spirit, of His distinctive work as the Sanctifier by attributing His work to Rome’s sacramental rituals. This official teaching is a straightforward denial of Person of Christ and His Gospel of grace! On the authority of Scripture alone, salvation is by grace alone, through faith alone, in Christ alone. Therefore, on the authority of Scripture alone, the claimed Papal “profession of faith” plus “the liturgy and the sacraments” is accursed! Nevertheless, the Roman Catholic Church teaches and performs such unfaithfulness to the Gospel of Christ. His acceptance of Roman Catholic bishops, priests, and nuns as brothers and sisters in Christ can mean only one of two things. Either Timothy George thinks the Pope and his followers do not believe their own teachings, or he thinks salvation can be by faith plus works. 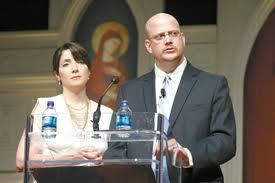 Greg Willits and his wife Jennifer, [pictured above] Catholic parents of five children, have been responsible for the distribution of over 2.5 million hand-made rosaries all over the world through their non-profit ‘Rosary Army’. Christians, in actual fact, are not called to spread “what is being said at the Vatican,” or to send out millions of Rosaries to teach people to call upon Mary. Thus, that which is called the “tsunami of new media evangelisers” is, in fact, just the ancient and persistent Roman denial of biblical Christian faith. Dignitaries of the papal confederacy are just now very prominent in benevolent movements, and we may be sure that they have ends to serve other than those which strike the public eye. A priest lives only for his church; he may profess to have other objects, but this is a mere blind...The sooner we let certain Archbishops and Cardinals know that we are aware of their designs, and will in nothing co-operate with them, the better for us and our country. Of course, we shall be howled at as bigots, but we can afford to smile at that cry, when it comes from the church which invented the Inquisition. “No peace with Rome is the motto of reason as well as of religion. Spurgeon could well have written that in October 2012 as last century. The “Year of Faith” not only is unfaithful to the Lord and His Gospel, but it also intends to seduce Christians into being unfaithful to Jesus Christ. Christians can fall prey to Rome’s seductive power simply because they do not recognize what is happening. 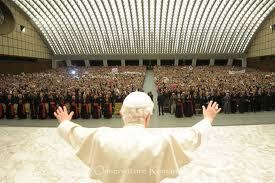 The power greater than the Pope and the Papacy is the power of the written Word of Jesus Christ! May our exalted Lord Jesus Christ through His Gospel of Grace expose the craftiness of the pernicious papal Year of Faith and bring it to naught.